I love strawberries. It is my favorite food or at least running for the top place next to blueberries. I also love scones. Not the dried out ones you find at Carb Co. or Parmucks, but the flaky, delicious and delicate scone that I’ve only made at home. This is the best scone recipe I have made. 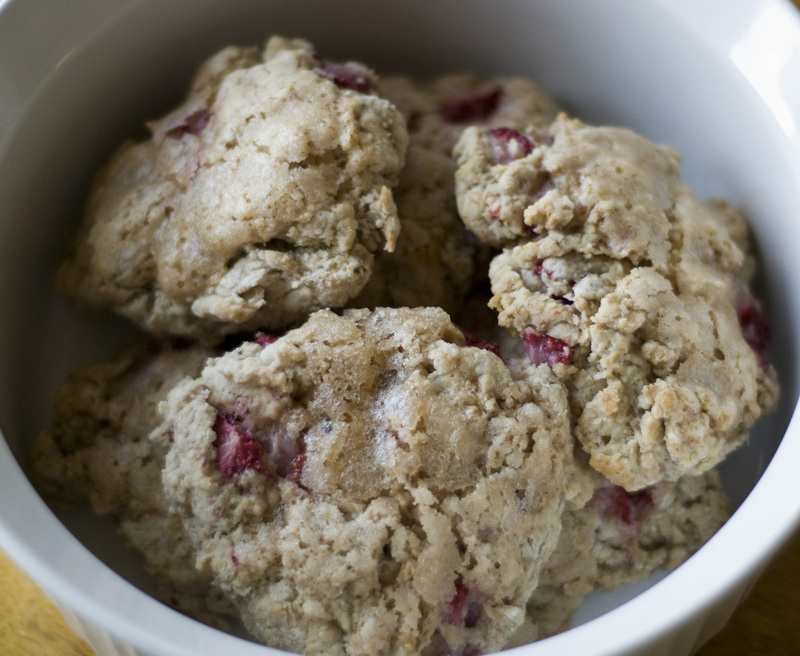 I also have very delicious raspberry scone recipe, but perhaps because these scones are different in that they are strawberry and they have a nice glaze topping that I like these a little better. Something different from same old, same old. 1. Preheat oven 375 degrees. Grease or line two cookie sheets or a scone pan if that flips your skirt up. 2. Process the 1/2 cup strawberries, sugar and half and half together in a food process or blender until smooth. 3. In large bowl, whisk together flour, salt and baking powder. 4. Using a pastry blender or your fingers if you don’t have one ( I mean a pastry blender… not a finger), add and crumble the butter in until it forms coarse crumbles. 5. Whisk together in another bowl: strawberry/cream mix, egg, and 2 tsp. vanilla. 6. Add the wet mix to the dry mix. Stir until barely comes together. Do not overmix! 7. Fold in 2/3 cup diced strawberries. 8. Drop dough by tablespoonful onto cookie sheet. I like my scones as big as my fist… which yielded 7 scones. 9. Make glaze: stir together the 3 Tbs. sugar, water and 1-1/2 tsp. vanilla. Brush or drizzle on each scone. 10. Bake 13-18 minutes or until just gold brown. The timing will depend on how large your scones are. 11. These taste best when cooled just slightly right out of the oven. They are still crisp. They lose their crispness when kept overnight. But they are still delicious for a few days. Simply warm in the microwave or oven. Store at room temperature.